As a promoter, Arum Knows that there are so much money still left in fighting those recycled fighters that they can benefit of. Both Juan Manuel Marquez and Miguel Cotto are free lancers while Timothy Bradley, the newly recruit of Top Rank is groomed by Arum to be his future cash-cow to replace Pacquiao in the event that the latter chooses to retire. After Pacquiao has reasoned out to Arum his preference of a Mayweather jr. fight in either late this year or early next year, Arum still sticks to his gun that Pacquiao should fight in November by selecting those recycled fighters he proposed to Pacquiao. Up to the time Arum left the Philippines after his talks with Pacquiao there was no clear cut indication nor confirmation from Pacquiao that he is amenable to Arum’s proposal. So the talks between Pacquiao and Arum have left hanging on the air whether Pacquiao is going to fight before the year ends. 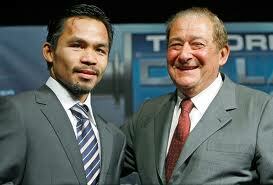 Arum on the other hand, is of the impression that Pacquiao would later agree to his proposal. But it has been more than two weeks have elapsed since Arum left the Philippines, Pacquiao is still non committal to the issue whether to fight this year or not. There should be mutual respect between promoter and boxer in this regard, that the promoter should have considered the preference of his fighter whom his fighter wants to fight. If the fight is not financially viable or that lucrative maybe Arum has the right to ventilate his side to protect his business interest, but this time Pacquiao has a valid argument whom he wants to fight. The promoter’s job is to make the fight happened and if he cannot do it for some reasons he must have been honest enough to inform his fighter, so that the fighter could look for other alternative other than his promoter to make the fight happen. Bob Arum must have sensed by now that he should have not rebuffed what his prized fighter’s counter proposal which is to waive the fight later this year and instead prepare the mega fight with Mayweather jr. to happen early next year. This is the first time in Arum’s visit to the Philippines that he did not get the approval from Pacquiao, usually he get the nod from his prized fighter right after his talks with Pacquiao. 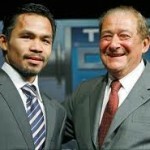 This time Pacquiao has spurned the plan of Arum as November 10 will be the schedule of Pacquiao’s supposedly next fight. But by not naming an opponent whom he wants to fight at least Pacquiao did the safest move to be non committal not only to his fans but to Arum as well. Just recently Pacquiao announced through his advisor Michael Koncz that he wanted to move the date for November to December but still without naming an opponent. For sure the proposed move by Pacquiao does not sit well with Arum especially he is responsible in arranging venues of such big event like this and changing venues at times is not that easy to do if it could affect his business interest. Whatever happens to the ongoing tug of war between Pacquiao and Arum hopefully this would not result in the bolting out of Pacquiao from Top Rank as what had happened to Oscar de la Hoya and Floyd Mayweather jr. who were both former prized mainstay of Top Rank.